Blue Mars Blog: Blue World Notes: Working User-Made Helicopter Flies in Blue Mars! Blue World Notes: Working User-Made Helicopter Flies in Blue Mars! It was created by a Blue Mars user known only as "0ne", who describes himself as an extremely new user, an emigre of the now-defunct world called There.com, where he also made vehicles. “I have spent more time in the City Editor than I have in the actual world,” he admits, laughing. 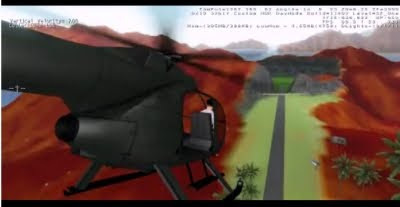 A programmer in real life, 0ne played around with Blue Mars’ Lua scripting until his chopper worked the way he wanted: “I used the ‘AddImpulse’ function to make it move, and I made it so that it always points to the helicopter's Z+ axis (up) so that it can go up/down. Then I used the same function to control the pitch, yaw, and roll of the helicopter in order to point the Z axis in different directions. So, which ever way the Z axis is pointing, the helicopter flies that direction (like a real helicopter.)" You can read more about 0ne’s chopper in the description of this YouTube video. Pay no attention to the visual quality of the helicopter itself: “[It] needs major upgrades so that it looks better in Blue Mars' awesome graphics," he tells me, "but right now I was just worried about getting it to fly.” (Priorities!) Even better, 0ne tells me he may bring a private jet he once made in There to Blue Mars too. What about Blue Mars should I write about next? Email and let me know: hamlet at bluemarsonline dot com.